Printed Beach Blanket. Design Your Own Custom Beach Blanket UK made. Relax in style on the seaside with your own printed beach blanket, featuring photos from special events or of happy memories. A generous 150 cm x 150 cm custom beach blanket will keep the sand at bay and provide a comfy resting spot, with a waterproof base layer ensuring you remain dry and warm. 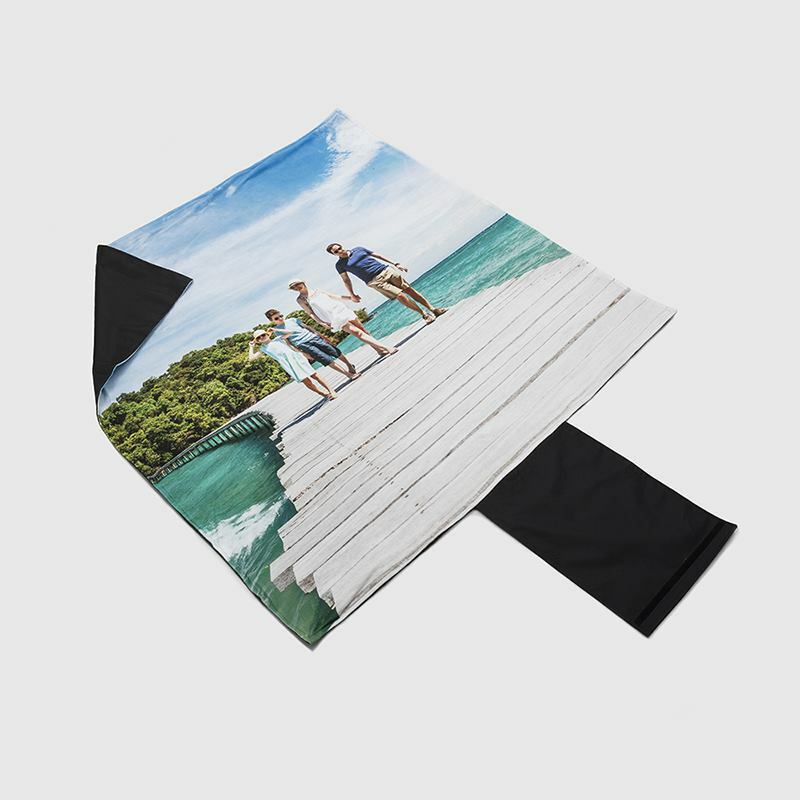 Whether you’re enjoying a relaxing coastal holiday or exploring your local beach or lake, keep comfortable and stylish with a custom beach blanket, printed with your choice of photos or text. Handmade in London, this luxurious printed beach blanket made from soft fleece is the perfect way to add an extra element of comfort to your seaside trip. A waterproof base layer keeps any dampness at bay and makes it the perfect blanket for beach days. It rolls up easily with a strap which can be used as a handle, so you can easily carry it around with you. At a generous 150 cm x 150 cm, this waterproof picnic beach blanket is the ultimate holiday accessory. Excellent quality fabric and design Would definitely come back. A particular staff member called Melissa was so helpful and patient with me - unlike Victor who seemed quite impatient and intolerant I will definitely use your company again but some staff training for those certain staff members who lack patience with people like me who aren’t very good with computers. Melissa, however, was incredibly helpful and didn’t make me feel like an imposition at all. I did thank Melissa and I also pointed out to Victor how I felt he was coming across. I don’t wish him to be reprimanded, I just want to point this out to you so that your staff members are helped more in their manner - especially when dealing with people who are t as computer confident. These super soft printed beach blankets are the perfect gift for anyone who loves spending time by the sea or any families who love a picnic. Because of its waterproof base layer, the blanket can easily double up as a camping blanket, picnic blanket, or even a cosy extra layer for your bed at home. Design two beach blankets and you'll get a discount on both. This incredibly luxurious printed beach blanket is grand, beautiful and very versatile. The fleece is printed, cut and sewn to order by our skilled textiles professionals all onsite in our London factory, and is incredibly soft to the touch with a high-quality fleece face. Your print will be displayed in high-quality edge-to-edge across the top layer of the blanket using a professional dye sublimation printing process. Expect bright colours, a consistent tone and sharp details in your photo reproduction. A matte black waterproof base adds depth and function to the blanket, and even though it is large it can easily be rolled up with its attached strap, which doubles up as a handle. If you’re creating a gift for a keen traveller about to embark upon an exciting adventure, why not adorn your custom beach blanket with photos of cherished memories of the two of you together? Create a collage in our easy to use online design interface, and experiment with different frame options to display the photos in a fun and unique way. If you want to treat yourself with this blanket for a seaside holiday, play around with sea life or ocean view prints to match the stunning view you’ll get to experience.